"Super Mario Land (スーパーマリオランド) is a platforming video game developed by Nintendo for the Game Boy handheld game console. 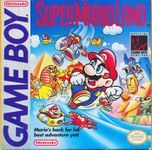 Super Mario Land marked Mario's first appearance on the Game Boy and is the first Mario game for the system. The game was a launch title for the Game Boy in Japan and North America. The plot revolves around Mario traveling to Sarasaland, which is split into the four kingdoms of Birabuto, Muda, Easton, and Chai. One day, a mysterious alien named Tatanga appears and hypnotizes the inhabitants of Sarasaland, including Princess Daisy. He kidnaps Princess Daisy. Mario then sets out to rescue her from Tatanga, defeating his minions along the way. He finally corners Tatanga, bringing down his alien warship and rescuing Daisy. Reviews of the game were generally favorable. The game drove initial sales of the Game Boy and has sold over 18 million copies in total. Super Mario Land was also the first game of the Mario series produced by Gunpei Yokoi. The game's sequel, Super Mario Land 2: 6 Golden Coins, was released in 1992." Source: Wikipedia, "Super_Mario_Land," available under the CC-BY-SA License.